Maybe yoga isn’t really your thing, but you still want to try an activity to help you relax. Maybe you love yoga and want to try another activity like it. Whatever brings you to this article, the activities I’ve listed below are possible alternatives that can help you de-stress, stretch or improve your well being, just like yoga does. Take a look. Tai Chi: This activity is actually a Chinese martial art, but there are several different ways of teaching Tai Chi and one way is non-competitive and focused mostly on slow, concentrated movement. A moving meditation, if you will. Tai Chi can be used as a tool to manage stress, much like yoga. Qi Gong: This spiritual practice also originated in China. It is viewed as a way to balance one’s “qi” or “life energy.” The practice includes meditation, slow movement and rhythmic breathing. Pilates: This activity was developed in the early 20th century by Joseph Pilates. It involves performing controlled movements that improve flexibility, strength, and posture. 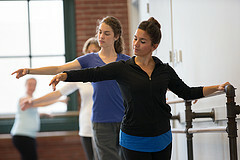 Mat classes are common, but some studios also offer classes using Pilates machines. Meditation: This is the practice of training the mind to slow down and observe the present moment, as opposed to racing through thoughts or feelings from the past or future. It is typically practiced while seated in a quiet place, but it is possible to practice meditation anytime or anywhere! Meditation can be practiced alone or with a group. Most yoga classes involve a short meditation as the beginning and end of class. today really began. Ballet classes focus on improving posture, flexibility and strength, but they can also be helpful for stress relief, just like other forms of exercise.